Colors I'm really excited about: San Tan-tonio, Y'all Come Back, Ya Hear? and I Vant to be A-Lone Star. Such fun colors for spring and summer, especially the orange! Hopefully I won't be locked away in an office the entire four months so I can actually use them and not be looked at strangely by a group of lawyers. I also think the pinks will make great pedicure colors. I'm not a fan of is the last one; shimmery lavender-gray doesn't sound appealing. 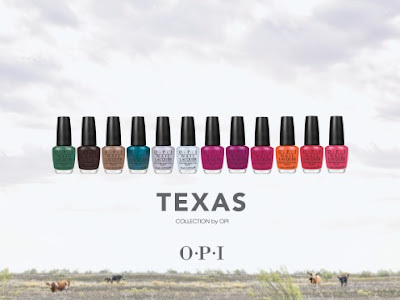 My boyfriend doesn't care a whole lot about fashion, but he did seem to think it was cool that they had a nailpolish color named after where he was from (Austin). I'm not sure I'm really going to like that color... it looks a bit metalic for my taste. But Don't Mess With OPI reminds me of Jade is the New Black from the Hong Kong Collection (which is my favorite collection in recent past). All of the reds, pinks and purples (including the two from the first six) remind me of the reds, pinks and purples from the Spain Collection a while back. And Suzi Loves Cowboys is the perfect dark brown color all you Essie lovers have been waiting for; I might even try it myself. I will be buying at least four of these to test out, so if you need a review of a specific color, you know where to find me!